Marshall, John (1755-1835) Secretary of State, Chief Justice of the US Supreme Court: Marshall was born on September 24, 1755, in Germantown. After serving in the Revolutionary War, he studied law at the College of William and Mary and in private, so that he was admitted to the bar in 1780. After being elected to the Virginia House of Delegates in 1782, 1787 and 1795; he was appointed as one of three American representatives to be sent to France on a diplomatic mission in 1797. The next year, he refused President John Adams' offer of an appointment to the US Supreme Court, choosing to continue in private legal practice. In 1799, Marshall was elected to the US House of Representatives, and appointed Secretary of State by President Adams in 1800. In 1801, Marshall was nominated and confirmed Chief Justice of the US Supreme Court. He continued to serve as President Adams' Secretary of State until the end of the term, and maintained the position for a brief period after Thomas Jefferson's inauguration, at the request of the new President. After this, he focused on the office of Chief Justice, a position he held for 34 years-- longer than any other Chief Justice in US history. 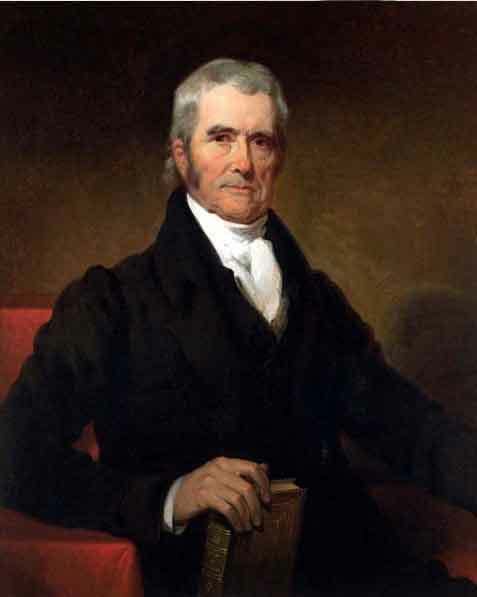 Marshall was the major force behind establishing the US Supreme Court as the final authority on constitutional issues. On July 6, 1835, Marshall died.